My letter in today’s Guardian argues that rising demand for fuller self-government in Scotland, Wales and Northern Ireland points to full UK federation as a better culmination of devolution than the disintegration of our country. When will any UK political party grasp this and thereby reap a great medium-term reward? Let’s hope someone will show my letter to Ed Miliband, the only current party leader with imagination, a long view and the required dash of courage. Professor Curtice calls devolution “a one-way process that seemingly can have only one conclusion – breakup and separation” (Devolution’s slippery slope, 10 October). The first of your reports on Scotland (Scotland gets a choice of ‘independence lite’ in referendum, 10 October) similarly documents popular pressure for fuller autonomy for Wales and Northern Ireland and for full fiscal autonomy for Scotland, with the Scottish Lib Dems advocating “fiscal federalism for all parts of the UK”, not just Scotland; and you report UK MPs inexplicably alarmed by Alex Salmond‘s indications of willingness to consider full fiscal autonomy for Scotland within the UK as a possible referendum alternative to independence. But it’s apparently taboo to mention either of the elephants in the room: how long England will passively watch the other three UK nations moving inexorably towards full internal self-government while England alone is denied its obvious benefits; and why those seeking a credible policy for saving the UK from disintegration still can’t see the obvious alternative to breakup, namely a full federation of the four UK nations – each eventually enjoying full internal self-government – with the Westminster parliament and government becoming the federal organs responsible for only those subjects that need to be managed on an all-UK basis. That, rather than disintegration, is the logical (and potentially most popular) culmination of the devolution process and, given some imaginative political leadership, one that could revolutionise the way we govern ourselves. There could be a rich reward for the first UK party leader to pick up this ball and run with it. A federal British solution as part of a wider constitutional settlement including Lords, Commons and the voting system? That gets some Lib Dem support. But England’s dominance (52 million out of 62 million) makes it tricky. But it’s precisely England’s dominance that makes a federal system necessary: full internal self-government plus equal representation in the federal second chamber (as in, for example, the US and Australia) would protect the three smaller UK nations from constant English interference in their affairs, a protection which partial and reluctant devolution fails to provide at present. Brian, As I said in response to your comment earlier today on http://britologywatch.wordpress.com/2011/10/13/scottish-independence-could-free-england-to-be-herself/ that presents a different perspective, I think the time for a federal solution may already have passed, and it may be more opportune to consider a confederal alternative. It depends how the new written constitution that would be required is drafted, in particular whether it allows for full sovereignty for each of the UK’s constituent nations; and, of course, it also depends on whether the Scots would be willing to bind themselves potentially ‘permanently’ to a re-cast UK. You seem to interpret Scottish nationalism as a mainly negative tendency: a reaction to what you characterise as ‘English’ dominance within the Union. But Scottish nationalists increasingly no longer have a chip on their shoulders in relation to England and are seeking to define a positive future for an independent Scottish nation, which they see as desirable in its own right and on its own terms. The same, I am bound to say, can also be said for the type of English nationalism I see myself as representing, i.e. it’s envisioning and elaborating the basis for a positive English future, inside or outside of a continuing Union. In a way, I’m almost agnostic about what form of ongoing framework connects England to the other countries of the present UK; just so long as England’s self-determination and democratic rights are assured. But I think you’re right to urge your party to seize the day with respect to federalism. However, I can’t see it happening because Labour is unionist and anglophobic, and is not interested in elaborating any positive social and political vision for England as such. Miliband can scarcely even bring himself to utter the ‘E’ word and, as his recent conference keynote speech demonstrated, it’s all Britain Britain Britain, even when he’s talking about English matters. I wish you luck, but I think you’re flogging a dead British nag. Brian writes: The suggestion that the time has passed for a federation of the UK nations seems strange. At what moment in the past was the time ripe for federation? Devolution, which has already brought the country to semi-federal status, was adopted mainly as a response to Scottish discontent at its insensitive treatment by a predominantly English UK government, and it has become clear since the election of a majority SNP government at Edinburgh that the current partial devolution has not gone far enough to produce a permanent, durable settlement acceptable to any of the three smaller nations. It’s only when the English governing class begins to appreciate the implications of a possible — but still unlikely — Scottish vote for independence that our leaders will start to take the idea of federation seriously. In other words, the moment for a commitment to federation has not passed at all: it is still to come. It seems to me faintly ridiculous, if I may say so, to complain that Ed Miliband talks more of Britain and British than of England and English. He is the leader of a British political party, not an English one, in a UK, not an English, parliament. We are agreed about one thing: the need for England to enjoy the benefits of its own parliament and government as the other three nations do, but for my part I see this exclusively in the context of gradual movement to a full federation of all four UK nations, with full internal self-government for all of them. I believe that only federalism can deliver a satisfactory, durable and democratic relationship between the four nations, and between the four nations and the UK as a whole. The likeliest long-term alternative, namely the eventual disintegration of our country, would represent a tragic failure of political imagination, courage and leadership which would gravely damage the interests of all the peoples of the UK, including England, and indeed those of Europe too. Much as I would like to agree with you, I find I must agree with David; I think the time is almost passed when a federation is a possible answer. I find more and more that it is rising English anger that is beginning to be heard and their choice is increasingly ‘independence’, and who can blame them? Being told over and over again that the are worthless, nationless and expendable, the English – as a nation – are turning their backs on both Labour and Conservative; and while not ready to embrace the likes of the English Democrats I do not believe it will be long before someone will stand up to be counted and then it all goes up in smoke. The silly idea that the English are a tolerant lot is OK as far as it goes, but history has shown that when driven they are anything but. And how can you possible embrace a federal solution when it is your party that is the major cause of their discontent? Do you think that they won’t see through your effort as simply a way to yourself elected, then ..nothing. There is not ONE politician that speaks for the English people; and resentment is growing. So what are you going to do Brian? the clock is ticking and time is running out. Brian writes: I know of no shred of evidence for any of these bizarre assertions. England is only in this undemocratic mess thanks to Labour. Of course they couldn’t extend their lopsided devolution act to England because how else could they have held power in England without their Celtic votes or pushed through legislation in England such as tuition fees without their Celtic MPs? Labour couldn’t care less about England and if Miliband should ever start to pretend he cares about the on-going discrimination in this unUnited Kingdom against England’s students, England’s sick or England’s elderly, once again it would be out of pure partisan self interest because devolution has backfired badly on Labour in Scotland. Having said that, the Scots will undoubtedly still send their army of Labour MPs to Westminster at the next general election. Cameron is no better than Labour in his contempt for the people of England, the very people who voted for him but if the United Kingdom does break up and for those of us in England who have had enough of it in it’s present form, the break-up can’t come soon enough, the blame will lay squarely on the shoulders of Blair and Brown when it happens. The break-up of the so called union began in 1998 and this will be their legacy, no-one else’s. Brian writes: None of these propositions makes sense, I’m afraid. England’s size relative to the other UK nations is the main reason for going the rest of the way to federation, not an obstacle to it. The proposition that “England is too big for the [pre-federation] UK” is literally meaningless: too big to do what? “Independence for England” is the most senseless of all: on what or whom do you imagine England to be dependent? This whingeing by little Englander nationalists about how England is supposed to be in some indefinable way hard done by is unseemly, indeed shaming. For centuries England has dominated the other nations, driving one and arguably two of them to the verge of secession from the Union: it does us English little credit to complain now that Scotland, Wales and Northern Ireland demand a much bigger say in running their affairs. it does us English little credit to complain now that Scotland, Wales and Northern Ireland demand a much bigger say in running their affairs. Errr I’m not complaining about anything. I want Scotland Wales and N.Ireland to have a bigger say in running their affairs, free from any involvement of England. As for ‘who do I believe England to be dependent on’. Let me make myself clear. I want England to leave the UK. Brian writes: Thank you. You make your position almost embarrassingly clear, but you haven’t answered my straightforward question. You say that you want England to become ‘independent’. I asked on whom or on what you think England currently depends? I argue that the moment has passed because I find it hard to imagine that the Scots will accept a new federal UK where sovereignty remains with the UK state. This is to some extent a matter of semantics, but it’s a crucial issue that I feel you don’t acknowledge. You talk of a federation guaranteeing “internal self-government” for each of the UK’s four nations (or five, including Cornwall? ); but is that the same thing as sovereignty? That’s why I think confederalism has better prospects than federalism, as my conception of confederalism is that each nation has full sovereignty and delegates up to the residual UK government the powers that it thinks are best shared; whereas, under federalism, the nations are ultimately subordinate to the federal government, whose powers and sovereignty are underpinned by a written constitution. Maybe you could have a federal system that allowed each nation a get-out clause if its people decided they no longer wished to be part of the federal state. As I say, it’s semantics to an extent, but it’s important to be clear about where you see power as residing in any federal / confederal blueprint. In any case, I think you underestimate the momentum towards Scottish independence, and if I were being ungenerous, I could characterise your analysis of it as itself anglocentric or Anglo-British. A ComRes poll today, admittedly based on a very small sample, indicated a clear majority of the Scots polled in favour of independence, and a small majority of people in the rest of the UK in favour of letting the Scots go. The point is the Scottish independence movement is a positive phenomenon now: seeking to define a positive way forward for the Scottish nation, rather than being merely a reaction to what you call reaction “insensitive treatment by a predominantly English UK government”. This characterisation of the UK government and political class as ‘English’ is another area where your thinking is a bit muddled, I feel. You can’t, on the one hand, criticise the political class for their ‘English’ / anglocentric attitudes and mentality, and, on the other hand, defend Ed Miliband for always talking in terms of Britain and never referring to England. Yes, Ed Miliband is the leader of a British party in the British parliament. But where’s the problem about referring to English (England-specific) policies as English, and in mentioning ‘England’ once in a while? There’s no justification or excuse for the almost total suppression of ‘England’ from the vocabulary of national politicians. The reason why the unionist politicians of all hues (Tory, Labour and Lib Dem) do this is that they’re paranoid that if they even evoke concepts such as an English nation or English policies, then people will wake up to the English democratic deficit and unequal constitutional position, and will start to demand an English parliament and government. And the British establishment is understandably terrified this will result in the sort of disintegration of the UK of which you speak. I understand your argument that a federal system is the best / only way to prevent this from happening. But it’s your British Labour Party that is largely responsible for bringing us to this pass, with its asymmetric devolution settlement, Gordon Brown’s anti-English Britishness crusade, and with the refusal of the established parties to engage with the English Question, of which their obdurate refusal to even say ‘England’ is the most extreme and pathological manifestation. You really do have your work cut out to get your anglophobic party to engage with these matters, and meanwhile, Scotland is racing ahead to a better, independent future. And who can blame them, given the self-serving and, as you say, unimaginative Westminster political class we have in the UK! 1. Devolution, when first introduced, was radical and controversial enough at the time: anyone proposing full-scale federation then would have been regarded as barmy. The idea that that was the right moment for federation is in the same category. 2. I have consistently argued that Tam Dalyell’s West Lothian Question can be solved only by full federation (or by the disintegration of the UK). Tam of course posed it as an argument against any kind of devolution, but devolution is now a fact. The anomaly which it encapsulates is a function of the unfinished character of devolution, not evidence of devolution’s failure. We are at an uneasy half-way house (hence Professor Bogdanor’s — not just my own — description of the UK constitution in its present state as ‘semi-federal’). The answer is to complete the journey on which we embarked with devolution by moving on to its logical destination, which is federation — however long it takes. 4. 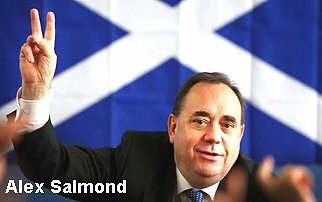 It’s a funny time to argue that the Scots wouldn’t be satisfied with full internal self-government within a single sovereign UK, just when Alex Salmond is proposing precisely that as an alternative to independence in his referendum, with all the polls and commentators agreeing that in a choice between that and full Scottish independence, a sizeable majority of Scots would vote for full internal self-government rather than full independence. 5. Those English people whom you describe as increasingly dissatisfied with devolution (and who I believe are a smallish minority compared with the indifferent majority) are basically dissatisfied with the consequences of devolution being only half complete: e.g. the fact that the Scots can do things such as making higher education free for Scottish students whereas England, lacking its own parliament and government, can’t do the same for English students (not that an English government would be likely to do so, in fact!). IOW, movement to full federation, including full internal self-government for England, would remove virtually all the grounds for current English dissatisfaction, such as it is. But it’s Scottish dissatisfaction with the limitations on its devolved powers that is driving the move for further constitutional change, not English. If and when that changes, I’ll let you know. 6. You take something of a risk in accusing me of being muddled when you yourself are clearly in a muddle over the differences between independence, sovereignty, internal self-government, federalism and confederalism. Those who live in glass houses, etc. 7. I don’t “criticise the political class for their ‘English’ / anglocentric attitudes and mentality” as you bizarrely allege: on the contrrary, I’m happy to leave that sort of self-pitying stuff to the chauvinistic (and often anti-British and anti-Scottish) Engnats. I recognise that England has a long history of dominating and interfering in the domestic affairs of the three smaller nations and that the best way to stop it is to complete the devolution process by federating, but that’s a completely different matter. 8. Your accusation of anti-Englishness on the part of Ed Miliband, the whole Labour leadership, Gordon Brown, the UK government and the UK governing class is so risible as not to be worth arguing about. And you talk about paranoia in others! I salute your chutzpah. That must conclude our dialogue here, each of us having now stated our respective positions at quite sufficient if not excessive length. May I add a couple of points that I feel are of relevance to the idea of independence for any part of the UK but are rarely mentioned. The first concerns relations with the EU. Let us suppose that Scotland becomes sovereign. It seems to be assumed, as it is in Catalonia and the Basque Country too, that the country would slip seamlessly and automatically into separate membership. While it would seem perverse not to accept continued membership of a territory that already enjoys membership (as long as it meets the necessary economic criteria as a separate unit), there are other matters to consider. The acquis communautaire would not be a problem itself but there would have to be negotiations about agricultural and fishing quotas, budget contributions, membership of committees, number of MEPs and no doubt a host of other things. For, let us say, Catalonia or the Basque Country that would be the end of the matter but Scotland would raise a host of other problems. Even with unbroken EU membership in the transition from being part of the UK to independent membership, it would be regarded as a new member state and I see no reason to suppose that any opt-out would be on offer. This would mean a requirement to join the euro (this is a theoretical discussion; the present eurozone crisis is irrelevant to the point) and to join Schengen. This would mean a separate currency for Scotland and passport controls on the Border. Ireland uses the euro but I think that the impact of having to change money to go to Scotland would be very considerable. And the impact of having to show a passport would be very striking indeed. At present there are no passport controls between the UK and Ireland, which is thus unable to join Schengen. It is by no means impossible to imagine that a Schengen Scotland might persuade Ireland to join that area too. That would leave Northern Ireland alone in a passport union with England and Wales. That might not prove a viable situation and the reunification of Ireland might well result. What about Wales? Might Wales also not wish to join Ireland and Scotland in the euro and Schengen? If that were to happen, there would be a centralised English state (without Wales) for the first time ever and it would be completely surrounded by other states with which it was not on good terms. In fact, a return to the 16th century! I introduce my second point by mentioning that a few days ago a couple of Spanish workers for Médecins Sans Frontières were kidnapped in Kenya. All the relevant resources of the Spanish state are obviously being deployed to ensure their release. But one of them is from Girona, which is in Catalonia. What if Catalonia were independent? It would hardly have the necessary diplomatic, intelligence and military resources to resolve such a situation. This is not an isolated matter. A couple of years ago two Catalan aid workers were kidnapped in West Africa. They were rescued by Spanish intervention in an area where it has historical interests and ties. At about the same time a Basque fishing vessel, the Alakrana*, was seized by pirates of the Horn of Africa. The Spanish navy came to the rescue. There is no way they could have been protected by the navy of a state with a population of under two million; it would have taken them at least six months to get their pedalo round there. My point is probably obvious. How can small nations protect their citizens in dangerous parts of the world? And if they cannot, will their people still be willing to take the risk? *The Alakrana had crossed a demarcation line set by the Spanish navy. The ship was flying a Basque flag and no Spanish flag when it was seized. That does not affect the legal position but it didn’t go down well in Spain. Just after the ship was recovered the Basque government, which had not long before complained about Spanish military manoeuvres in the Basque mountains, called for Spanish military to be deployed on Basque fishing ships. They were told that this was not possible, for obvious reasons. Spanish fishing ships in the Indian Ocean now have private armed protection. This caused a problem with the government of the Seychelles, where they are based. There was no objection in principle but the Seychelles government was not keen on having its ports used by merchant vessels from another country that had heavier weaponry than its own navy used – and it must be admitted that they had a point. Now the guns are not mounted in territorial waters. Brian writes: Many thanks for this powerful and thought-provoking comment, Peter. It should be compulsory reading for Alex Salmond and all who sail with him. I think that you may even understate the problems that an independent Scotland might experience in seeking membership of the EU. The Germans in particular could be extremely wary of admitting another small state to membership when its economic and financial viabilty is at best unproven, its commitment to fiscal rectitude rather than populist extravagance à la Grecque is in doubt, and the possibility of the need for a future bail-out by the richer members of the EU impossible to rule out (who’ll forget what happened to the Royal Bank of Scotland in a hurry?). There’s another general argument for resisting, as far as possible, the further Balkanisation of Europe and the rest of the world. The dissolution of the Soviet Union and Yugoslavia into mostly small and weak states, with the division of Czechoslovakia and the further division of Serbia following the western-organised secession of Kosovo, have all made sovereign governments individually weaker in the face of the globalisation of international capitalism. Huge unaccountable multinational corporations are already beyond the control of any single democratically elected government, and the more numerous and smaller our countries become, the less their governments have the muscle to protect their peoples’ interests against the global military-industrial-financial complex. Moreover, the greater the number of EU member states, the more difficult it becomes to manage the EU, since the greater the number of members, the greater the problem of achieving unanimity, even on issues which touch on the very survival of the Union: witness the recent antics of the parliament of Slovakia, with a population representing (I believe) less than 2% of the population of the EU. This will increase the pressure for more decisions by majority voting instead of the requirement of unanimity, a process likely to be ferociously resisted by (e.g.) the UK, France and many smaller EU governments which won’t readily give up their beloved vetoes. Fragmentation of the UK and applications for membership as new states from Scotland and possibly even Wales would thus be extremely unwelcome in Brussels. It would be rash to assume that a Scottish application would be given an easy ride. Moreover no-one should underrate the time it would take and the fearsome problems that would have to be resolved before the separation of Scotland from the rest of the UK (not just from England) could take place. There would have to be negotiations with a much stronger rump-UK government over the division not just of revenues, including oil revenues, but also of the national debt and of the original capital costs of oil exploration and development; over the future of all the UK government’s assets in Scotland (including dockyards, military installations, nuclear bases, army regiments, airfields, and much more); of the question of Scottish inheritance of all the UK’s international treaty obligations as far as they are applicable to Scotland, as the great majority are — what of the US-UK extradition treaty? how could Scotland be prevented from becoming a tax and criminals’ haven? ; of arrangements for managing sterling, the SNP having confirmed that it would want to continue to use sterling as its currency; the question of the Crown and the royal succession, the SNP having similarly said it would wish to keep the Queen and her successors as an independent Scotland’s heads of state; the future of an integrated mail service covering the whole of the present UK (a separate Scottish mail service would be horribly expensive given the isolation and underpopulation of Scotland’s highlands and islands); the future of the BBC; the definition of each country’s territorial waters and the implications of that for oil; the question of citizenship — by what criteria would the thousands of Scots living in England, Wales, Northern ireland, the US, Africa and just about everywhere else qualify for the new Scottish passport? What about the English spouses of Scots? What about English people living in Scotland — would they lose their right to vote? Who would provide consular and diplomatic protection for Scots in trouble abroad (English, Welsh and NI taxpayers might need a good deal of persuasion that they should take this on after the Scots had spurned the British connection), which is the question you persuasively pose in your comment? No doubt negotiated answers to all these and a few thousand more such questions could be worked out eventually, but it wouldn’t be easy: given the imbalance between the respective sides, the outcomes would not necessarily in each case be what the Scots would want; and the whole process could take years (the UK rump would see no need for undue haste). And finally, what if the negotiated settlement of all these tricky problems turned out to be so unfavourable and expensive for Scotland that a majority of Scots thereupon decided that independence on those terms was not worth it after all? Not impossible! It seems inevitable that as the SNP’s referendum draws nearer, some of these bleak realities will increasingly begin to be recognised; those who hope to save the UK from disintegration will surely wish to ensure that they are. It’s an open question whether they will be sufficiently discouraging to damp down Scottish ardour for independence, especially if the alternative of full internal self-government, fiscal and other, is also on offer. A full federal system for the four UK nations might suddenly start to look both feasible and attractive! Nationalism is a powerful and not always a rational force, so nothing is certain — except that it’s high time for this kind of practical discussion to begin without delay. Thank you for your kind words. I do not doubt for one moment the enormous complexity of the bilateral negotiations facing Scotland and the UK but I was focusing on the EU aspect. I take your point about the problems caused by small countries such as Slovakia in the last few days, and also by the Czech Republic in threatening the Lisbon Treaty – although Poland also threatened not to ratify that. In practice, however, it would be politically impossible to refuse membership to an existing member territory that fulfilled the requirements. After all, Iceland has just had preliminary informal talks about joining the EU and euro, and Serbia has been accepted as a potential candidate. Apart from that though, it is clear that when this crisis has been resolved (assuming it is), it will be on the basis of a more centralised financial structure for the Union with a proper Treasury and eurobonds. This would prevent a recurrence at least of the recent Slovakian silliness. The SNP may have said that it wants to continue using sterling as its currency but that is not a matter within its control. The EU will certainly expect it to use the euro. Maybe an explanation of non-euro states might be useful. When the euro was introduced, three of the existing member states negotiated opt-outs; they were the UK, Sweden and Denmark. The Danish krone was pegged to the euro as it had previously been pegged to the German mark. The others floated but since the 30% devaluation of sterling in 2008 it has remained pretty constant at around €1.14. However, since the euro was introduced membership of the common currency has been compulsory for new members if they meet the criteria, and if they don’t they are expected to join as soon as they do. Cyprus and Malta did so in 2008, Slovakia in 2009 and Estonia in 2011. Bulgaria, Lithuania and Latvia have their currencies pegged to the euro. The only major member state not to use the euro is Poland. In this situation the pressure on Scotland to adopt it would be very great indeed. Even if a Scottish opt-out could be agreed the price would be considerable, but the prospect of a seceding part of the UK wanting to join the EU half-heartedly by keeping sterling would send such a negative political image that it could well prove to be a breaking point in the negotiations. You mention crime and extradition. I have nothing to say about the US-UK treaty and its application but Scotland would be able to issue European arrest warrants for execution in England. How would that go down with English public opinion? Finally, the EU is developing a system whereby consular facilities can be provided to EU citizens by any member state. However, providing a lawyer for someone who is arrested or repatriating someone who runs out of cash is a very different matter from rescuing kidnap victims. Brian writes: Thank you again for some more very telling points. I wonder how many Scottish enthusiasts for independence have pondered the possibility of being effectively obliged to adopt the Euro and thus having to operate a different currency from that used south of the border? As you rightly point out, it would also mean having to cede important policy instruments to the European Central Bank, with which an independent Scottish government would have substantially less influence than Scotland has with the UK Bank of England and the UK Treasury as long as Scotland continues to use sterling. All these points suggest yet more complications affecting both a Scottish divorce from the rest of the UK and a Scottish application to join the EU. I wonder whether officials in London, Edinburgh and Brussels have begun to toil far into the night researching the implications of all these problems and writing options papers with a range of possible solutions to be put both to the governments concerned but also eventually to the Scottish, English (etc) and EU peoples — indeed, whether they have even begun to draw up a list of all the problems that would need to be addressed if Scotland were to vote for independence in the referendum promised for barely two or three years’ time? If not, it’s surely about time they did, with maximum transparency and publicity. The Scots are entitled to be made aware of all the implications before they vote in the referendum, not to be confronted with them when it’s effectively too late. Sweden does not currently use the euro as its currency and has no plans to replace the krona in the near future. Sweden is obliged under the Treaty of Maastricht to adopt the euro at some point in the future. Under the 1994 Treaty of Accession Sweden has to join the eurozone once it meets the necessary conditions. Sweden maintains being part of ERM II is a required criterion and joining ERM II is voluntary, giving Sweden a de facto opt out…he EU has accepted that Sweden is staying outside the eurozone on its own decision. Olli Rehn, the EU commissioner for economic affairs has said that this is up to Swedish people to decide.